Happy Monday, dear readers! I hope you had a wonderful weekend and your week is off to a great start thus far! For today's blog post, I have the pleasure of sharing another polish created for the inaugural Polish Pickup. But first, let me fill you in about Polish Pickup. Polish Pickup was created and run by Adrienne and Sarah of Fair Maiden Polish and was designed to replace the traditional polish collaboration box. In brief, it starts with a fun and interactive group on Facebook. Each month, members submit theme suggestions, and the organizers chose the top 10 submissions. From there, these theme suggestions are presented to the group and the theme selected by popular vote. Makers then design their polishes to fit the chosen theme and are then sold at Polish Pickup during a designated time frame. While all polishes are based upon the theme, there is no box commitment with these beauties. You can buy as many or as few as you wish, creating your own personal box! No more having to decide if you should or should not buy a box of four polishes when you only want two shades! Only one polish speaking to you? That's ok too! You buy only the shades you want; as result, you can save money and not have the hassle of trying to sell off what you don't want. Sounds easy, right? I know I'm excited about it! Now that I've filled you in on hoe Polish Pickup works, we can check out today's featured polish! 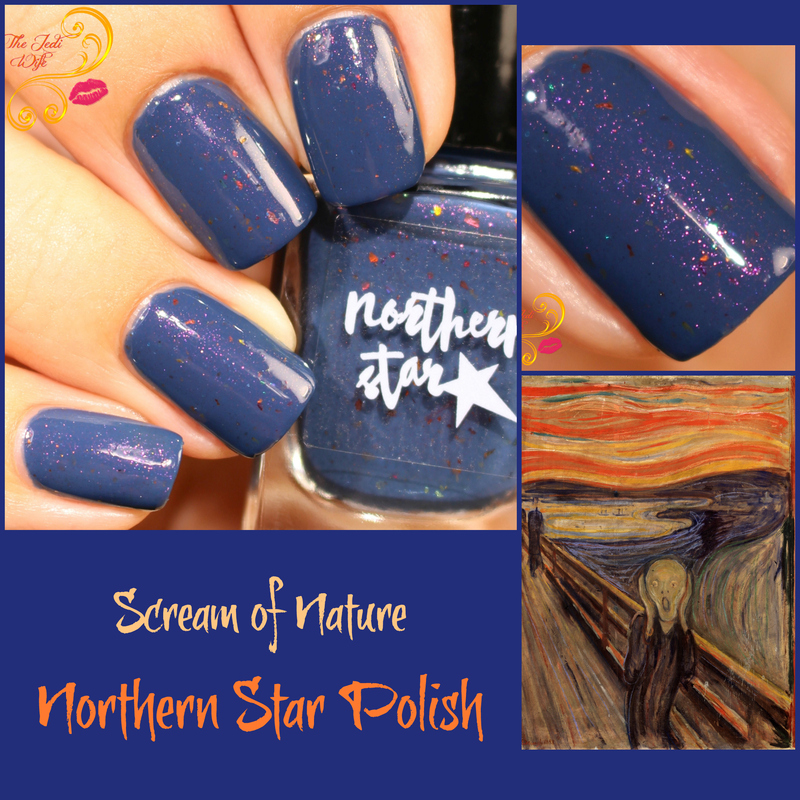 The theme for April's Polish Pickup is Famous Works of Art, and I was thrilled to discover that Kristin, the designer behind Northern Star Polish, selected "The Scream" by Edvard Munch as her inspiration. 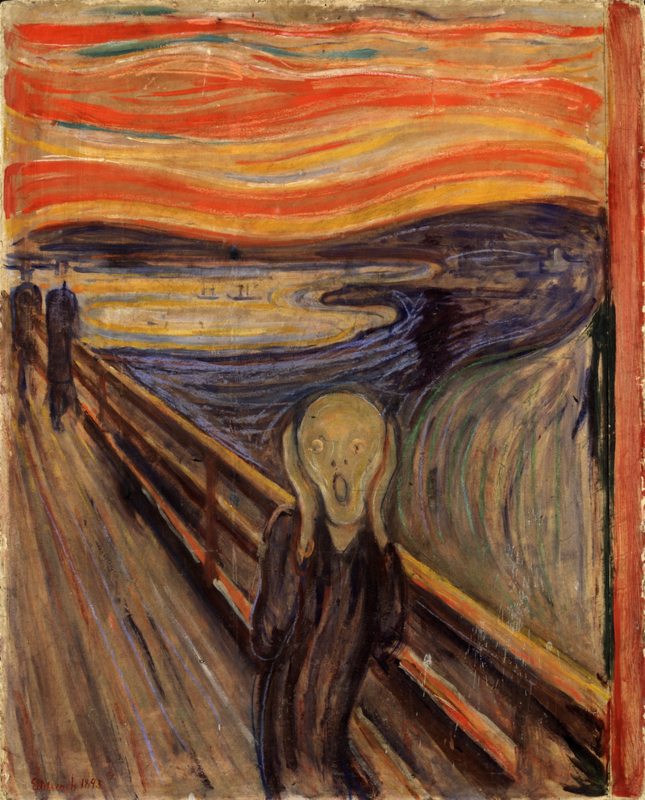 The iconic image of an androgynous skull-shaped head with open mouth is a widely recognized form of art, but what many don't realize is "The Scream" is actually the name of four versions of similar composition. The first is a painting of oil, tempera, and pastels; the second and third were created in pastels; the final composition is a painting created with tempera. 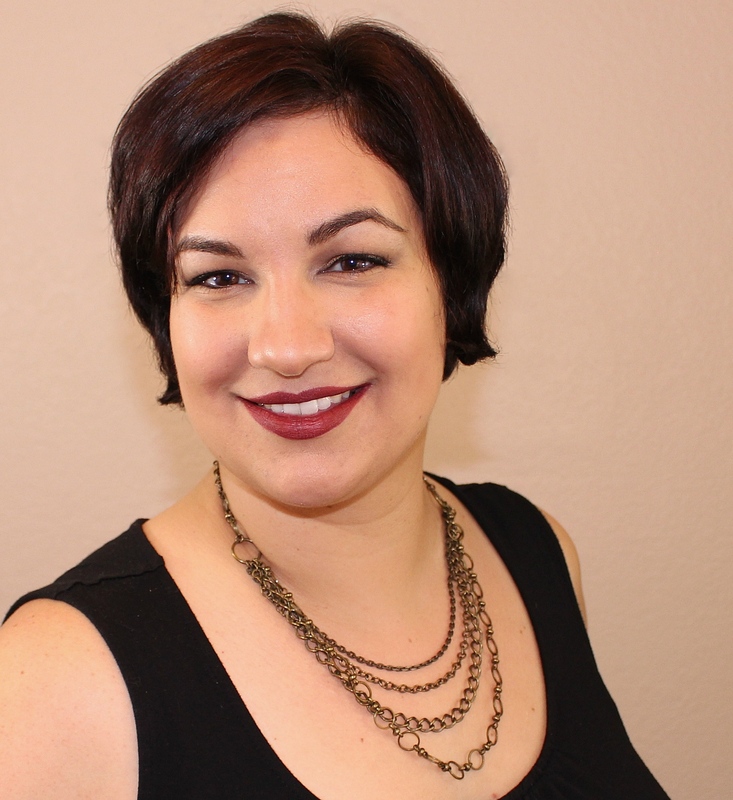 I know, I know, this is a beauty blog, but I thought it was interesting and had to share. Now let's look at some polish photos! Inspired by the bold colors of the painting, the polish has a navy leaving teal base with red/gold/orange shifting flakes and pink/copper chrome pigment flash in the background like bursts of color against a dark sky. This is such a pretty interpretation of The Scream! My orange-loving heart was initially hoping it would be, well, orange, but I'm really feeling this one! Scream of Nature beautifully captures the dark and moody feeling of the composition, and I suspect the blue base will appeal to a larger audience than an orange would. I also really like the volume of flakes used: there is plenty to add beautiful pops of colour on your nails without overpowering the polish. The pink and copper chrome pigment flash adds the perfect sparkle to the nails as well and one of my favorite things about this polish. As for application, the formula is so perfect is just about applies itself to the nail! Smooth and creamy, the only effort you may have to put into apply this polish is pushing the occasional flake back onto your nail as they may hand over the free edge during application. Not only is the polish pretty, the inspiration behind the name, Scream of Nature, is really interesting. Much was also quite a writer and kept a diary. He wrote about his inspiration for The Scream, and it is from this quote that Scream of Nature was born. "I was walking down the road with two friends when the sun set; suddenly, the sky turned red and blood. I stopped and leaned against the fence, feeling unspeakable tired. Tongues of fire and blood stretched over the bluish black fjord. My friends went on walking, while I lagged behind, shivering with fear. Then I head the enormous infinite scream of nature." Scream of Nature will retail for $9, and it is limited to 50 bottles. Please note that Northern Star will have an updated logo label and bottom label that differ from what is shown here. Scream of Nature and other polishes created for the Famous Works of Art theme from the Polish Pickup website located here. Shop is live Friday, April 7th 11 AM EST through the following Monday, April 11th at Midnight EST. This is the ONLY time frame in which the monthly polishes will be available for purchase, so if you want this or any of the other polishes, be sure to mark the dates on the calendar! Please note that this is a preorder and shipping will commence approximately two to three weeks after the end of the store opening. At this time, Polish Pickup has made the decision to ship only within the US and Canada; however, special arrangements can be made for international group orders. Love the inspiration and I love this polish! I agree with you that I would have loved more orange but I get why she went with a blue base. It's absolutely gorgeous! I'm excited about this box and this polish is stunning. I am a fan of navy polishes and I love the complexity she created with the shimmer and glitters. I've seen this bad boy mattified and it made me drool! Munch is a fabulous artist and I love the different tones and glitters in this blue polish! Beautiful swatch! This is an interesting concept and a nice change from the box collaborations. Also, Northern Star did a fantastic job interpreting an iconic art piece! To be 100% honest I don't get the resemblance between the polish and the picture, but with that put aside, I think it's a beautiful color! This polish is completely unique and perfect! One of my favorites in a long time! Love the inspiration and the polish!!!! Gorgeous swatches!!! I love the magenta peeking through that polish. I haven't bought a Northern Star polish in a long while - I love their branding! This polish is just outstanding! That polish is a real beauty! Beautiful polish and so many brands to choose from! Lol. Wow! That polish captures the picture perfectly! Ouuu I can't remember if I picked this one up or not but you have me REALLY hoping I did!